Volutella Blight Causing Boxwood Dieback. 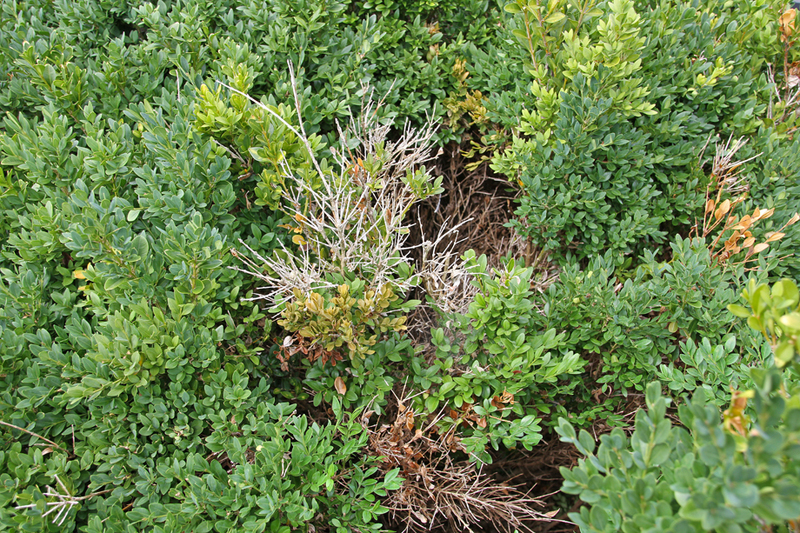 Landscapers and gardeners may be seeing scattered dieback on boxwoods this spring. One candidate for the sectional dieback is Volutella blight. Both English and American boxwoods are susceptible to this disease which is caused by the fungal pathogen, Pseudonectria buxi (also called Volutella buxi). The fungus targets stems where it produces girdling infections. Symptoms first appear in the spring and intensify with new growth. Leaves turn light yellow then brown and eventually drop from infected stems. A close examination of the affected stems may reveal loose bark and constricting girdling. A careful removal of the bark will expose chocolate colored phloem tissue with a distinct transition zone between dead stem tissue and healthy green tissue. The disease may be managed by pruning a few inches beneath the transition zone. Of course, sanitation pruning may significantly disfigure heavily infected plants. NOTE: boxwood defoliation and dieback may also be caused by a number of other problems including salt damage, winter injury, boxwood leafminer, and various root rots. "Box blight" caused by the fungus, Cylindrocladium buxicola, should also be eliminated before making a Volutella blight diagnosis. This highly destructive fungus typically causes a rapid decline of entire plants rather than sectional dieback. If box blight is suspected, we urge that you send affected plants to our OSU Extension, C. Wayne Ellett Plant and Pest Diagnostic Clinic, for confirmation [ http://ppdc.osu.edu/ ].